Cheteshwar Pujara, Right hand cricketer represents Indian cricket team in international formats. Made his debut match against Australia in 2010 and representing India in ODI and Test formats. 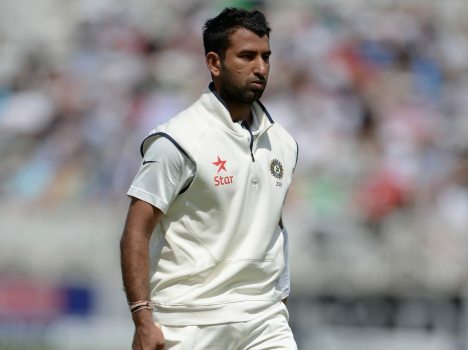 For more details check out below for Cheteshwar Pujara Wiki, Biography, Age, Profile, Height, Caste, Affairs, Family and more. Cheteshwar Pujara was born on 25 January 1988 in Rajkot, Gujarat, India. His father, Arvind Shivlal Pujara, was a Ranji Player and his mother, Reema Pujara. Pujara made his Under-19 Test debut for India against England in 2005. In the first innings, Pujara scored 211 runs as his team won by 137 runs. He was also picked in the Indian squad for the 2006 Under-19 Cricket World Cup after scoring three fifties in four innings of the Afro-Asia Under-19 Cup. He scored 349 runs in 6 innings including 3 fifties and a century. He was the Man of the Tournament for the 2006 Under-19 Cricket World Cup. Cheteshwar Pujara married Puja Pabari in Rajkot on 13 February 2013. When he was 17, his mother died due to cancer leaving him distraught. – Cheteshwar Pujara made his test debut against Australia on 9 October 2010 at Bangalore. – In August 2012, he made a comeback into the team and made his first International Test century, 159 against New Zealand at Hyderabad. – In 2013, at the age of only 25, Pujara became only the ninth batsman to score three career first-class triple-centuries. – In the first three seasons of Indian Premier League, he played for Kolkata Knight Riders franchise. – Royal Challengers Bangalore franchise was bought Pujara for 2011, 2012, 2013 IPL seasons. – Ahead of the Indian Premier League 2014 auction, he was bought by Kings XI Punjab and played six matches with opening partner Virender Sehwag. – On India’s tour to South Africa in 2013, he emerged as the highest run scorer in the Test series, scoring 280 runs at an average of 70.00. – Pujara passed 2,000 runs in a year. He has scored 2,043 runs at 102.15 in first-class matches in 2013. Only Chris Rogers with 2,391 runs at 48.79 from 28 matches has made more in 2013. – Highest second innings score of 153 by any Indian batsmen in South Africa. – Pujara climbed to a career-best number 2 spot in the rankings for Test batsmen his double century against Australia in March 2017. That’s all about Cheteshwar Pujara Wiki, Biography, Age, Height, Weight, Family, Caste. Post your comment below and check out our latest updates.